Rear Admiral Timothy C. Gallaudet, commander of the Naval Meteorology and Oceanography Command, with Brian Lehman of the Esri Defense team, discussing the marriage of ocean science and GIS. A three-year agreement between the the US Navy's Naval Meteorology and Oceanography Command (NAVMETOCCOM) and Esri, signed in September 2014, will use ArcGIS to substantially improve battlespace awareness by integrating data, incorporating expert knowledge, and using GIS-based analytical tools. Currently, a navy decision maker at sea must assess risks by mentally integrating data from many digital and nondigital sources such as nautical charts, reports on atmospheric and ocean conditions, and operational reports. The process is cumbersome and suboptimal. However, by exporting all data to a GIS, data can be integrated and analyzed. Local patterns and mission area expertise can be incorporated into the analysis process. Commanders can ask what-if questions and receive immediate, map-based answers. At the same time, the navy will also be standardizing processes it uses for provisioning warships with charts, imagery, and maps from the National Geospatial-Intelligence Agency. The San Diego-based Space and Electronics Warfare Command (SPAWAR) plans to field common datasets for battlespace awareness. A data appliance modeled after Data Appliance for ArcGIS will provide access to nautical charts and maps of land features. Sailors on provisioned ships can organize all analysis, intelligence, and operational planning efforts using a foundation of common, authoritative basemaps. Map-based products will include imagery and nautical charts. Preprovisioning ships with basic geospatial datasets will save precious satellite bandwidth. Only updates and real-time data from remote sensors will then need to be transmitted to warships at sea, resulting in more timely decisions and less dependence on satellites. 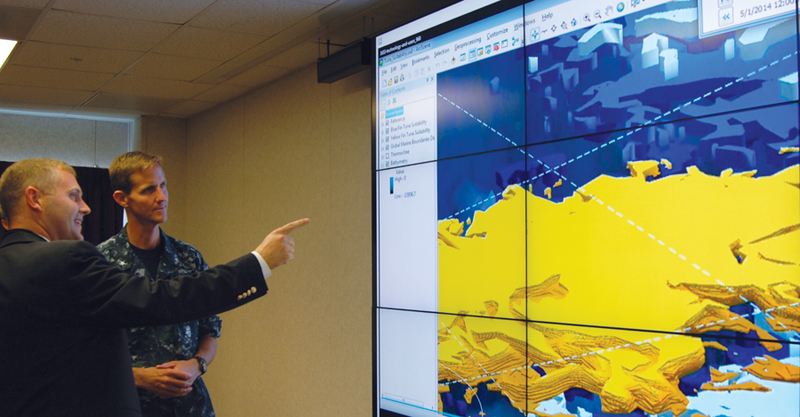 A longtime user of ArcGIS in its many subordinate commands, NAVMETOCCOM uses GIS to explore weather forecasts to predict their impact on ship movement and air operations as well as inform naval commanders of the effects weather, hydrology, and oceanography might have on naval missions. The agreement contributes to more effective and safer operations for the US Navy.